Christmas movies are a guilty pleasure of mine. I find it so easy to get caught up in the warm glow of the lights and decorations and the whole spirit of the season that many of these films project, from the classic (It’s A Wonderful Life) to the not so classic (Santa Baby) to the downright cheesy (Holiday in Handcuffs). Somewhere in there is Call Me Mrs. Miracle (2010), a sequel of sorts to the Hallmark made for television movie Mrs. 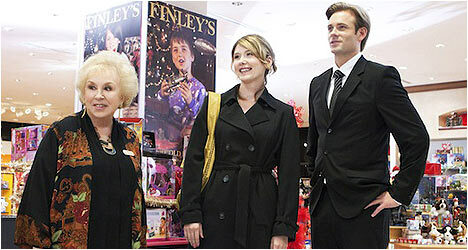 Miracle (2009) that featured veteran character actress Doris Roberts as Mrs. Merkle a.k.a. Mrs. Miracle, a kindly old woman who may be an angel that helps solve people’s problems and bring holiday cheer. She returns once again in Call Me Mrs. Miracle, this time as a kind-hearted toy department clerk working at a family-owned department store in New York City that is struggling to survive. Holly Wilson (Staite) takes care of her brother’s son Gabe (Lord) while he’s serving over in Iraq and also juggles a demanding job as a glorified assistant for her boss Lindy Lowe (Holly), a demanding fashion designer. While getting coffee for Lindy, Holly meets Jake Finley (Johnson) who works for his gruff father (Butler) at their family-owned store, which is in trouble. Jake believes in selling old school toys while his grinchy father pushes for boosting sales by stocking the hot new in-demand toy, the Intellytron robot. Both Holly and Jake are nice, good-looking people destined to be together but must overcome their mean-spirited bosses for this to happen. Naturally, Mrs. Miracle will be instrumental in these two crazy kids getting together. Taking a break from the genre films and T.V. shows she’s known for, Jewel Staite brings her considerable irrepressible charms and charisma to the role along with a dash of neurotic humor, like when she tries to prepare meals for Gabe. We instantly sympathize with her and want to see Holly have a happy ending. It helps that she has good chemistry with Eric Johnson. They have a nice scene together where their characters take a horse-driven carriage ride through the city and reveal things about themselves. Johnson is a good-looking guy and Jake seems nice enough but he lacks depth, which is down to the screenwriting. Lauren Holly has a blast vamping it up as Holly’s vain, blowhard boss. Doris Roberts gets to play the benevolent angel who acts as matchmaker and champion of Christmas spirit with sass and what they used to call gumption. Much like the underrated Mr. Magorium’s Wonder Emporium (2007), Call Me Mrs. Miracle champions classic toys that spark the imagination, like Slinky’s, train sets and board games, instead of sterile plastic toys that break easily. It is pretty easy to figure out how it will all turn out but the pleasure is watching the characters get there. Director Michael Scott does a nice job of bathing New York in warm, inviting colors and doesn’t rely heavily on emotionally manipulative music. Plus, any Christmas film that champions old school toys, small stores vs. the big chains and the true spirit of Christmas is okay in my book. Call Me Mrs. Miracle is a pleasant enough time waster and fans of Jewel Staite should enjoy it for the amount of screen-time she gets. The film has a certain low-key charm and comfy movie vibe that is a welcome relief amongst all the rampant commercialism of the holiday season.